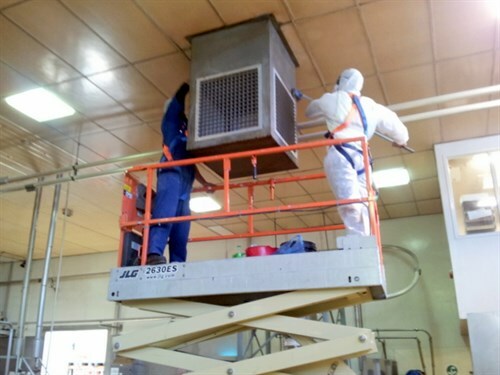 The mission was to clean and paint the entire production hall interior prior to commencement of the installation of the brand new processing plant from Germany. This really was a mission. The floor area was around 7500 square metres. Within eight hours, we had costed and planned the whole project. 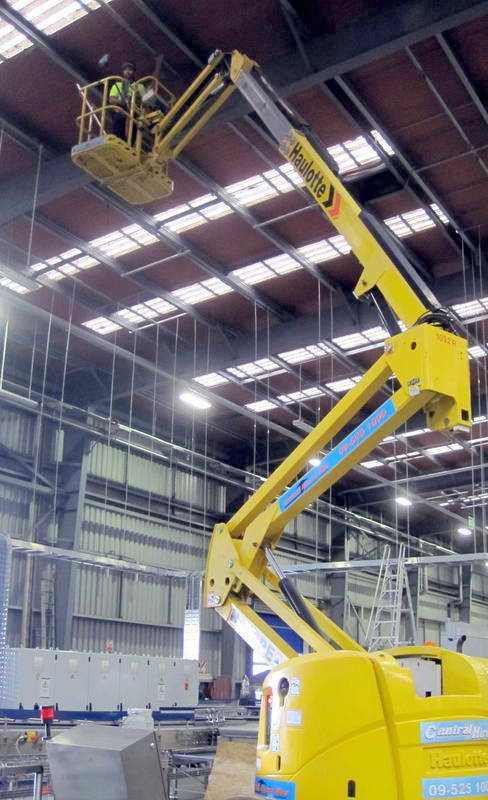 The access equipment for two weeks included two JLG 450E knuckle booms and two scissor lifts. We had to remove birds, nests and general grime built up over many years then install new bird netting in the apex of the roof where there were gaps letting the birds in. Using low pressure super-heated water (no chemicals) we cleaned all Perlins and steel RSJ structural beams. Then we used a two pot epoxy paint system to paint the Perlins and RSJ beams for easy cleaning. The recommended paint colour was an ‘off white’ to give maximum light and reflection. Airless spray enabled the required film build of both coats to save time and money. The final step for the roof area was to apply an antimicrobial coating to the painted surface to minimise the chance of bacteria in the future. Cleaning of the floors was a major issue as there was a build-up of many years grease and grime. This was the first time we had used our new sweeper and scrubbing machine. It took several scrubs on the worst parts of the floors, but they looked great when finished. Fortunately our team were already inducted for working on this site. The team, led by Andrew Chan, were NZQA qualified for safe working at heights and permit receiving. We ran two shifts and worked seven days a week to meet deadlines, our Contracts Manager, met with the project manager every day to ensure smooth running of the project. Any changes or extra work were accommodated with no fuss. This project was completed on time and within budget. On completion of the new plant being installed and commissioned, we carried out a final clean of the complete building and plant and applied an alcohol-based sanitiser to finish everything off.